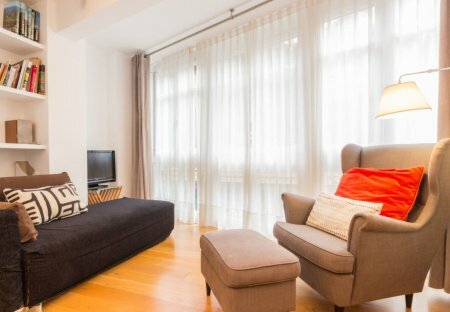 This 1 bedroom apartment is located in Bilbao and sleeps 2 people. 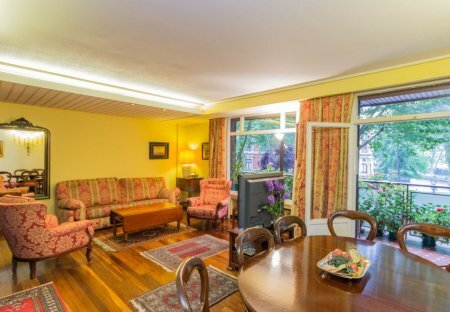 This 2 bedroom apartment is located in Busturia and sleeps 4 people. It has WiFi, a garden and barbeque facilities. The apartment is near a beach. On the northern Atlantic coast in northern Spain, Basque Country borders Cantabria and Burgos Province to the west, the Bay of Biscay to the north, France and Navarre to the east and La Rioja and the Ebro river to the south. This autonomous region of Spain is well known for its world-class gastronomy and rich cultural heritage, boasting around 40 Michelin-starred restaurants, plenty of museums, breathtaking architecture, upscale bars and an incredible world of art and theatre. The surrounding landscape is a natural playground for outdoor lovers, rich in river valleys, forests, meandering cliffs and snow-capped mountains dominating the region between the Atlantic and Mediterranean basins. Whether you're after a relaxing holiday close to nature, a low-key cultural break, or once-in-a-lifetime road trip, the beautiful diversity of Basque Country means that it caters to all types of holidaymakers. From Gorbea Natural Park to the Guggenheim and Balenciaga Museum, Basque Country offers attractions for everyone. Unwind on San Sebastian and Mundaka's tranquil beaches, wander the capital Vitoria's historic centre with the stunning 13th century Santa Maria Cathedral, kayak down the Ebro river and sample the local rioja wine with a tour around the architectural wonder that is Ysios winery. For nature lovers and keen hikers, take in the full extent of the majestic beauty of your surroundings from Txindoki mountain. Explore our holiday homes and properties in Basque Country and choose from properties in the historic centre, rural homes by the coast and apartments near the golf and beaches. A direct flight from London to Bilbao Airport takes approx. 1hr 30 mins. There are also indirect flights to Vitoria and San Sebastian. Basque Country's climate varies from region to region. The average temperature in summer is 25°C. Basque Country has its own language which is completely unrelated to the other languages of Europe and older than the Romans! Gorbea Natural Park is a protected and mystical woodland located between Alava and Vizcaya provinces. The Cathedral of Santa Maria de Vitoria is a must-see for its stunning Baroque architecture, located in the historic quarter of Tolosa. There are 11 golf clubs in Basque Country; the most popular being Real Nuevo Club Golf De San Sebastian Basozabal.